If you follow me on Instagram, and watch my Stories, you know that I run through the Panhandle and Inner Richmond to Golden Gate Park most mornings. 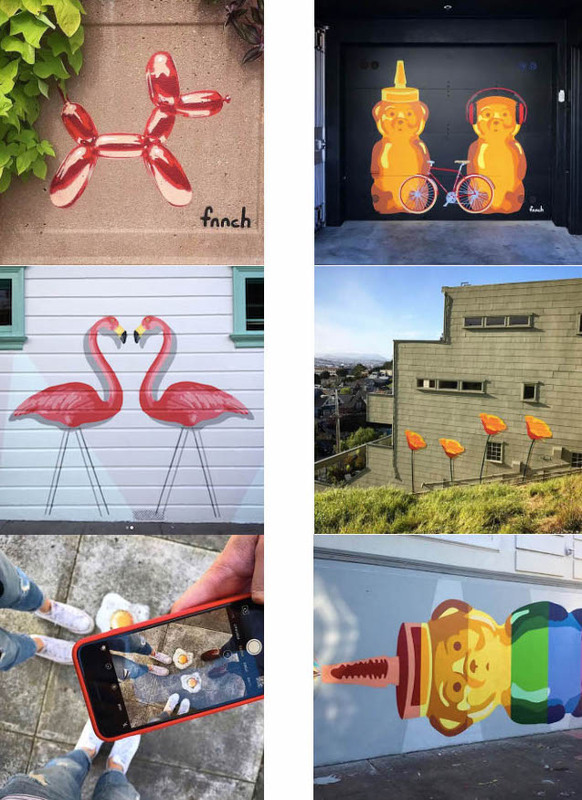 Over the past year, I’ve noticed more and more stenciled honey bears popping up around the city. Then it was a lady bug when I stopped to tie my shoes, and later a bright blue butterfly. After some research I learned that it’s the work of street artist fnnch. Since it’s a particularly dreary Thursday morning and I’m about to go for a run in the San Francisco fog, I thought I’d share some of my favorite fnnch street art. You literally can’t help but smile when you pass a honey bear or sunny side up egg. The majority of his work is done on styrofoam panels so there’s no permanent damage done to the places he paints, they simply bring a little more beauty to this pretty city. And in case you’re interested, you can get your very own honey bear here (he also recently created a La Croix collection that’s reminiscent of Warhol’ Campbell's Soup Cans). All images from fnnch's Instagram.